I wasn’t feeling creative today with a heavy schedule and to do list but I picked up a few of new markers and just started coloring. And it felt good. I felt creative and I think anyone can feel that way with these! Coloring an image can be fun and yet sometimes frustrating! We want to have that multi-dimensional, blended effect but regular markers leave lines and edges. Stampin’ Up has added a new line of alcohol markers called Stampin’ Blends and they are officially available today! You can get one marker, or 2 markers or a bundle! I love that individual markers are available since I tend to use a lot of the light Pool Party, for example. Because they are not refillable but very reasonably priced at 4.50 a piece, I can just get just one if I need it. If you do order the whole bundle now, they will come individually wrapped for freshness rather than in a box. Press fit seal lids prevents air from entering the barrel and causing evaporation. They are also nest-able to stack while you are coloring. SAVE BIG on the BUNDLE of BLENDS! If you have been a demonstrator before or would like to try it out for the hobby discount or business, you can get the whole blends bundle in your starter kit and save a bunch! In the starter kit, you can choose the bundle for $121.50 and pay only $99 plus tax and free shipping! That’s a savings of around $34 on the bundle if you want to join SU in November with me. The whole collection item number is #147475. Basics of Blending by Stampin’ Up! 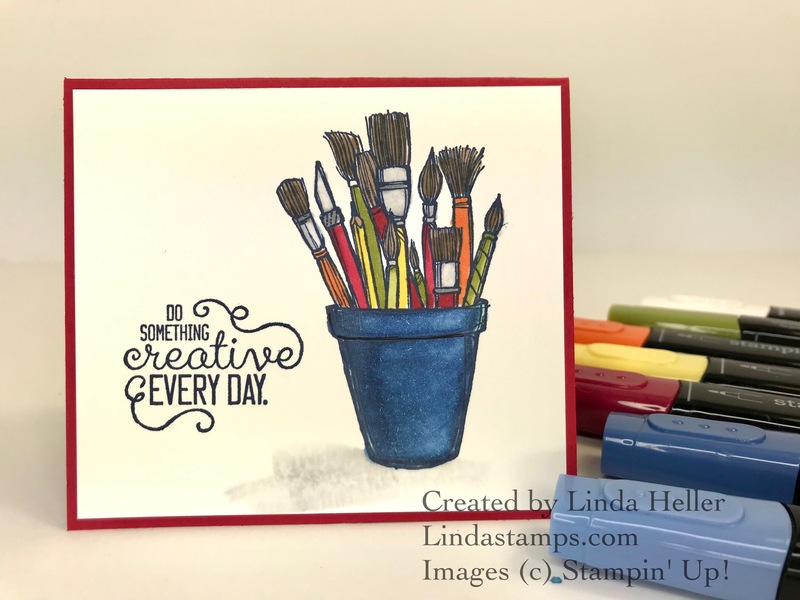 Color Me Happy Project Kit – While Supplies Last! Are you looking for a fun and easy card kit? The Color Me Happy Card Kit includes 16 adorable cards. You will need Pool Party, Night of Navy, Pink Pirouette, and Pumpkin Pie dark and light Stampin’ Blends to color. If you decide you want to order the new Blends from me, I have a completed color chart and gift for you!